The Programma P101 may be considered as the first programmable electronic desk top calculator in the world. At the time, Olivetti was called 'Olivetti Underwood Corporation'. 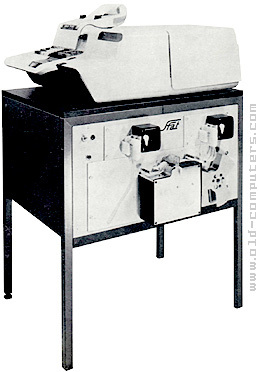 The P101 was also the first programmable machine small and medium size companies could afford. Besides several tens of thousands machines were sold, mainly in USA. There were neither microprocessor (not yet invented) nor integrated circuits in the P101, but only transistors, resistors and condensers. Instructions could be executed directly through the keyboard as in a conventional calculator or stored in memory and then executed by the Control and Arithmetic units. The memory holds 9 registers that could store numeric data or program instructions. Each register could store one 22-digit number plus sign and decimal point, or two 11-digit number, or 24 program instructions. Five registers could store instructions, so the maximum length of a program was of 120 instructions. Program and data stored in memory could be saved into a magnetic card thanks to a built-in cards reader/recorder. The calculator used a form of 'cache' memory for storing the results of the last operation. This was done with a Pulse Delay Line, a device that turned the data into mechanical vibrations along a wire, serial fashion. A sort of 'SAM', Sequentially Accessed Memory. The Pulse Delay Line was invented in the 1940's for RADAR and the crude computers of that time . One year later, Olivetti released the Programma P102 (pictured) which was the same machine but featured a serial RS232 connection and allowed printer, Teletype or paper tape puncher/reader (up to four) to be connected. Thanks to Gerard Touitou for information and pictures. The Programma 101 was the first "computer" I ever used. I was in high school and the school bought one for the math curriculum. It never got used in the mainstream program but students who wanted to experiment with it could. It was pretty much as described, with an instruction set that consisted mostly of the functions on the calculator keypad. Programs were keyed in, and saved onto cards that were about the size of a standard punch card, with a labeling surface on one side and a complete magnetic coating on the other - no wimpy mag stripe here! We used the 101 mainly to implement numerical methods for generating trig functions and the like. The magnetic cards were a real breakthrough in technology. They were made in plastic, and one side was printed and had place for title of the program, comments etc. ; the other side was completely covered with the typical brownish magnetic layer. The magnetic track was near the long edge of the card: cards could be turned upside-down to use the track near the other edge of the card, so that each card could store two programs. A neat feature was the use of the areas marked V, W, Y, Z. When the card was fed through the reader, it would pop out under the keyboard, in correspondence with the "function" keys V, W, Y, Z. The comment written on the card would therefore appear under each key, a useful reminder of the functions linked to each key in that particular program. The P101, and particularly the magnetic card, was covered by a patent (3.495.222 of march 1st 1965) and this gave to Olivetti over $900.000 in royalties by HP alone for the re-use of this technology in the HP9100 series. Everything in the Programma 101 clearly show the very high standards of design and engineering that were adopted in its construction. The case, for example, is about the size of a large, old desktop PC (a little bit larger, in effects). It is not build like today's PC by folding a sheet of metal, but to avoid interferences is cast in alluminium, about three millimeters thick and alone it contributes to the machine's weight of about 35 kilograms. The exterior was designed by Mario Bellini, a young architect of the Sottsass' team, soon to become one of the top industrial designers of the following years. The Programma 101 earned its place in several museums for its design, and Bellini kept working for many more years for Olivetti and was responsible for some of the other visually wonderful machines (calculators and typewriters) of the following years. SIZE / WEIGHT 48 (W) x 61 (D) x 19 (H) cm. / 29 Kg. see more Olivetti Programma P101/P102 Ebay auctions !